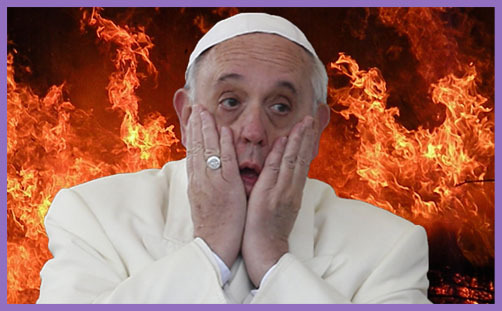 And all hell broke loose: Vatican scrambles after pope appears to deny existence of hell; Did Pope Francis Abolish Hell? ; Vatican: Pope did not say there is no hell; Vatican makes it abundantly clear that Pope Francis believes in hell; Hell ‘does not’ exist…sinful souls ‘disappear,’ Pope Francis allegedly tells favorite interviewer; Did Pope Francis Say Hell Doesn’t Exist? ; Vatican rebukes journalist who quoted pope as denying hell… etc., etc. There is, at the very least, a degree of confusion. Eugenio Scalfari is 93 years old, and seemingly conducts his interviews without making notes or recordings, which makes their reliability rather questionable and their verifiability impossible. He puts the words of Pope Francis in quotation marks, which means the Pope said them. Or Eugenio Scalfari thought the Pope said them. Or Eugenio Scalfari thinks he remembered the Pope saying them. But we don’t actually know if Pope Francis said ‘There is no hell’ because we weren’t there. The Vatican has issued its clarification (ie ‘spin’) that the Pope is indeed Catholic, but the wonder is that such a clarification needed issuing in the first place. Because it isn’t as if Pope Francis isn’t aware that Eugenio Scalfari has form in this regard. Why would the Pope consent to be interviewed again and again by a journalist with a known propensity for misquoting or misremembering and sowing confusion among the faithful (not to mention the world)? Why would the Pope trust the frail and flawed memory of a nonagenarian? Why would he not insist on notes being taken or a recording made? Why would he not ask for quotations to be sent to him for approval before publication? Any and all of these requests would be perfectly ethical and reasonable in the world of journalism. But Pope Francis doesn’t appear to be overly concerned with being quoted accurately. Or perhaps he trusts Eugenio Scalfari to report his words faithfully and purposely leaves the fallout for the doctrinal legalists and dogmatists to sort out; those who believe that the Roman Catholic Church cannot contradict Scripture or circumvent the Magisterium without invalidating her mission. He is mercy and compassion; they are judgmental and cruel: “Their hearts, closed to God’s truth, clutch only at the truth of the Law, taking it by ‘the letter’, and do not find outlets other than in lies, false witness and death,” he once told them. Is it possible for a pope to say ‘There is no hell’ and to remain pope? Is it possible for a pope to sow confusion and to remain pope? There is, of course, no shortage of laity who are more Catholic than the Pope, and they pontificate about this Pontiff like he’s the worst thing to sit on the throne of St Peter since Rodrigo Borgia. But maybe he’s simply nudging the Magisterium toward greater enlightenment and deeper truths. To obey is better than sacrifice. But let’s not pretend that theology is not pastoral, and that to disentangle theology from its social setting renders it foolishness to those in need of healing, sustaining, guiding and reconciling to God through Christ.